Two people who live by these ideas are Jennifer Frye and Allan Bunch of The Moment Magazine. The Washington, DC-based duo work in tech—Frye as the technology project manager for a museum and Bunch as the VP of a local startup—and see art as an integral part of their professional and personal lives. 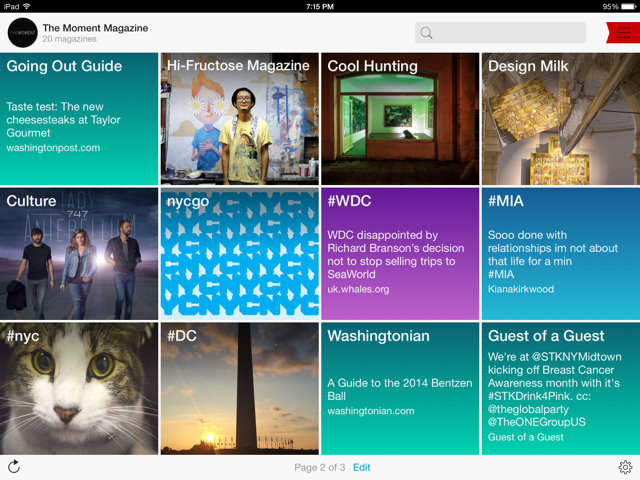 On Flipboard, the pair slip into the role of curators. The Moment’s virtual gallery of city guides, art news and trends is updated daily with selections ranging from the offbeat to the essential. With so much available eye candy, we wanted an insider’s guide to having great taste. So we asked: what are you reading? The Moment began as an opportunity to share with the world stories around our collective interests and experiences. Our first daily posts were explorations in art, food, music and travel. Before long, we realized that our collection of stories truly resonated with our readers, so we set out to understand why. With so much available content focusing on culture, what was it that attracted people to the musings of our experiences? It wasn’t long before we started to uncover the answer: positivity. With positivity as our beacon, we set out, every day, to curate the best content for our 14 Flipboard magazines that span culture, art, fashion, technology, design, food and local guides to New York City, Washington, D.C., and Miami. Instagram: We subscribe to images tagged with #contemporaryart, #streetart and #lovenyc as well as several talented NYC photographers like Kevin Lu, Gary Hershorn, Wrongrob, DARIO NYC and JMSUAREZ. One of the best parts of any day is coming across those few images out of the multitude that we can’t wait to share with our readers! Twitter: Nothing beats Twitter for finding out what is happening at events like Art Basel, New York Fashion Week and SXSW in real and near time. 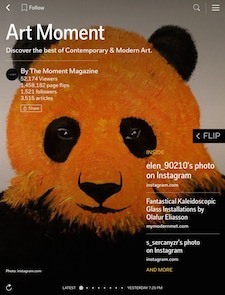 Flipboard Picks and Instagram Gems: We love checking out the inspiring content shared by the Flipboard team in Flipboard Picks and Instagram Gems. 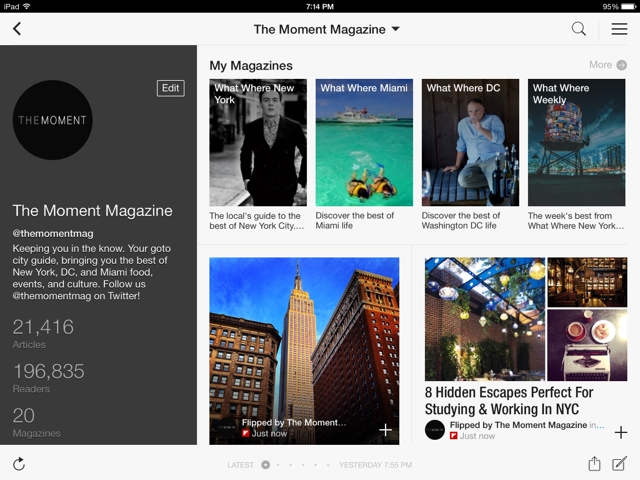 Both magazines are our favorite jumping off points for exploring magazines offered by other Flipboard MagMakers. 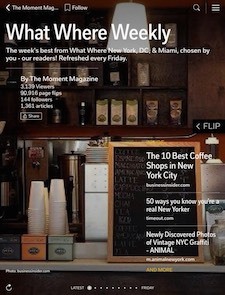 Of course, we are always very excited if we find one of our flips featured in them as well. Untapped Cities, Time Out New York, Gotham Magazine, Guest of a Guest: On a consistent basis, we can always count on these wonderful folks for insights on what’s happening in NYC. Blouin Artinfo, Hyperallergic, Colossal, Arrested Motion, Artsy: Fantastic sources for keeping up-to-date with contemporary and modern art. 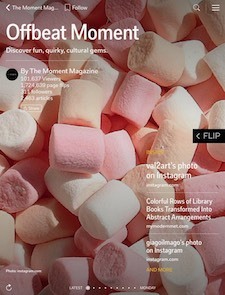 Cool Hunting, Wired, Fast Company, My Modern Met: Commendable sources for a wide variety of cool, motivating and inspiring stuff. Our Flipboard readers know that we keep them up-to-date on topics ranging from fashion, to local happenings, to offbeat delights. Aside from our specific sources, what all but a few know is the test that each must pass before publication consideration: our smile test! As we uncover exciting nuggets to share with our friends, if it makes us smile, The Moment readers are likely to see it. It’s our way of connecting with our magazine fans. When you read a fun Offbeat Moment story, gaze at a photo in Art Moment, visit an event you discovered in What Where New York, or try that recipe from Culinary Moment, you can be sure that what you’re experiencing made us smile. And when our readers comment, letting us know that we brought a bit of cheer to their day; well, that’s why we do what we do. 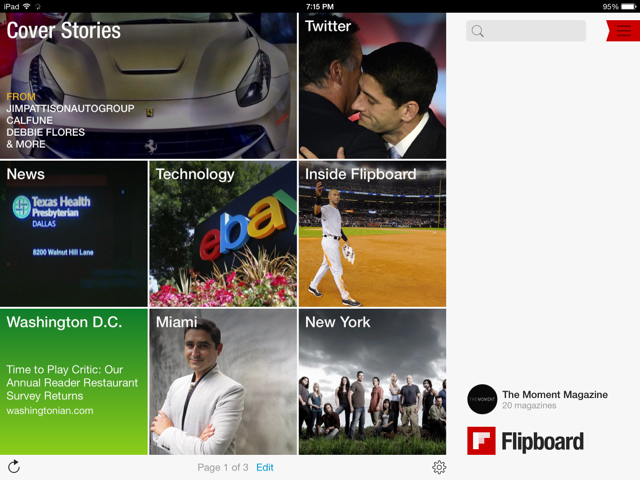 That’s why The Moment is on Flipboard.